Product prices and availability are accurate as of 2019-04-26 05:52:52 UTC and are subject to change. Any price and availability information displayed on http://www.amazon.com/ at the time of purchase will apply to the purchase of this product. The Wayne WCS50T cast iron sewage pump is great for sewage basins, septic tanks and lift stations. Features a heavy-duty 1/2 hp (horsepower) motor and a tethered switch for automatic operation. The vortex impeller design reduces clogs and the rugged cast iron housing provides durability.WARNING: This product can expose you to chemicals including diethylhexyl phthalate (DEHP) which is known to the State of California to cause cancer and birth defects or other reproductive harm. . 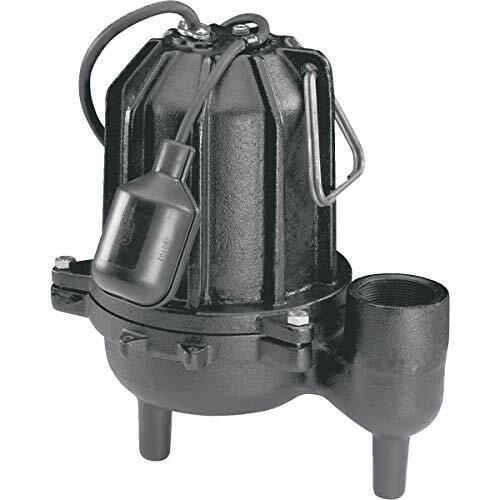 Item: Sewage Ejector Pump Size: 1/2 HP Capacity: 7,680 GPH at 0' Material: Cast-Iron Discharge Size: 2"